Place of Birth: Macclesfield, Cheshire. Marital Status: Living with partner, Pete and little dog Ali. When did you begin cycling? I began in 2008. Pete bought me a bike for my birthday so we could spend some time together as he was just starting to get back into mountain biking. At the time I was racing racehorses so I saw it as an opportunity to improve my fitness for that too. I had a massive crash on our second outing so the bike got put in the garage for a few months but was brought out again when the sun came out. To help improve my confidence on the bike I went on a skills course where I found out you could race them. I went back home and was straight on the internet checking out the races I could do. This will be my second season of racing. I did a 35Km Trail Break challenge which wasn't really race but I enjoyed the aspect of competing on a bike. I then went and did the last round of the Southern XC at Borden in the Sport female category and I won...but there were only two of us in the category! I loved it and was totally hooked, again coming home and entering in more races. What are your strengths/weaknesses as a racer? I think a major strength is that I'm brave, I'll have a go at anything which sometimes is a weakness too, I've had my fair share of crashes! I also never give up, I'll push myself as hard as I can no matter if I'm winning or if I'm at the back of the pack. I think my weakness is purely not enough experience at racing; I still have a lot learn. What are your current and future goals in cycling? My goals for this year are to be consistently within the top ten of the Elite category and gain some experience at the top level in other cycling disciplines. My long term goals are to be National Champion and to represent Great Britain at a major Championship. Have you competed in any other sports? When I was at school I competed in Pony Club Tetrathlon (running, shooting, swimming and horse riding) this led on to Modern Pentathlon where I was lucky enough to compete internationally and regularly competed at a national level. This passion for horses led me to horse racing where I was an amateur Point to Point jockey for four years. 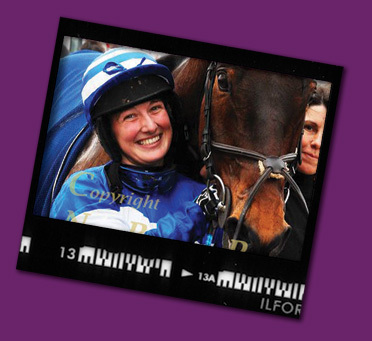 I achieved 6 wins and was the South Midlands Lady Champion Jockey in 2006 and third in the National Novices Title. I think doing different sports has given me the discipline to train and race hard in cycling. What is the best piece of advice anyone has given you whilst cycling? Pete is always telling me that ‘Speed is your friend' when I'm going too slowly over something, it's quite true sometimes it's harder to do things slower. I read an interview with Maddie Horton and she was asked the same question and answered keep off the front brake, I think that's a very important bit of advice which I remember when I'm flying over the handle bars! Who do you admire most in cycling? I think Jenny Copnall is an amazing rider, she's always so smooth and stylish and her achievements are unbelievable. Name your perfect night in and perfect night out. Night in would be a dinner party with some friends, one of Pete's home cooked meals, lots of chatter and laughter. Night out would be an evening at our local curry house, they're a great bunch that run it and you can always be guaranteed a giggle. What's currently on your iPod? I have a really odd mix from Jimmy Eat World to Johnny Cash so my iPod is almost permanently on shuffle. But if I have to pick something I'm mostly listening to the Rudimental album, a bit of Daft Punk and the Foales.